Abby Covert shares advice for making the unclear clear. If you want to learn the concepts of information architecture and start practicing it yourself, you should come to Generate New York in April, where Abby Covert will run a full-day workshop and follow it up with a talk at the conference that will help you make sense of any mess. According to Abby Covert, the web need information architects. In her rescheduled Generate talk, Covert will reveal how to become one, what makes it challenging, and why it can ruin your life. Websites used to be reasonably straightforward things, but as the web marched forward from niche interest to omnipresence, things got more complicated. Not merely in terms of technology, but also in terms of volume. Back in the Nineties a corporate site could get away with being made out of flat pages and a sidebar navigation. Today, though, it might consist of hundreds of pages, if not thousands. Organising such massive web presences is an increasing challenge; not merely the nuts and bolts of taxonomy, but also the messier business of implementing it all within organisations where political and technological arguments can hamper the process. People can agree that they need a better website, but no one likes to be told that they’ve been doing it wrong. This is where information architecture – or IA – comes into play. It’s enjoying a resurgence, and Abby Covert is one of the practitioners bringing it. Educated in graphic design, she had her first taste of information architecture at university. “It was mostly focused around distilling complex subject matter into graphics like a poster or an information graphic,” she tells us. Then in her first job out of school she worked as an icon designer, which led to her first information architecture job. So what exactly is information architecture? Covert herself sums it up as making the unclear be clear: taking a whole mess of information and figuring out the most effective structure and language for it, in order to build accessible, navigable and manageable systems, sites and apps. Covert explains that it’s a fundamental skill set within practices such as UX or interaction design. “I would say the closest words that people may have heard of more recently would be content strategy, which is also a very close sister pattern to information architecture in terms of a practice,” she says. The reason IA is returning to prominence now? “If you look at the evolution of the web over just the last decade it’s incredible how much has changed,” she observes. “Even in the early days of websites, you used to be able to rely that people were going to start at your homepage and then they were going to go from there. When search engines came about and started to get very detailed in terms of crawling something more than just your URL then you had to start thinking about people landing on deep inner pages of your site. Then add to that the persistence of social media sharing content out of context. If the science of IA is reasonably straightforward, however, the actual business of implementing it can be less so. 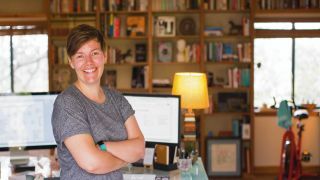 Covert estimates that while 20 per cent of her job is the core business of drawing diagrams and mapping out fresh information structures, the other 80 per cent is what she describes as persuasion, politics and facilitation. “It’s hard to go into an organisation and critique something that somebody spent years creating,” she notes. And it’s this that can make IA a tremendously difficult discipline to teach, something that Covert does alongside her IA practice. “I was terrible when I first started doing this kind of work,” she recalls, “because I just thought that if I came up with something that made sense to me, and I tested it and it made sense to users, that I could then give it to other people in an organisation and that they would believe me. As with web design and development, it’s a job in which you never stop learning. “I feel like every time I’ve got my hands around this thing and I think that it’s solid and I can grasp it, it changes. Without any set qualifications or career path, information architecture can be a difficult business to learn about and establish yourself in. There are quite a few books on the subject – with Covert’s own book, How to Make Sense of Any Mess, serving as a great introduction. Abby will be one of the speakers at our web design event, Generate New York, on 25-27 April 2018. You can view the full star-studded lineup, and book your tickets now, at generateconf.com. This interview first appeared in net issue 292.